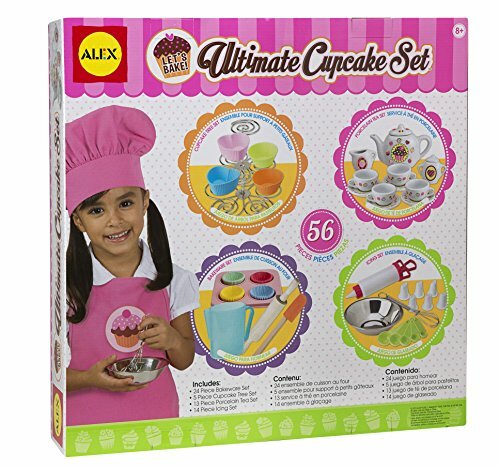 ALEX Toys Let's Bake Ultimate Cupcake Set makes sure there is always room for play dessert! This 56-piece set has plenty of accessories to act out countless scenes. 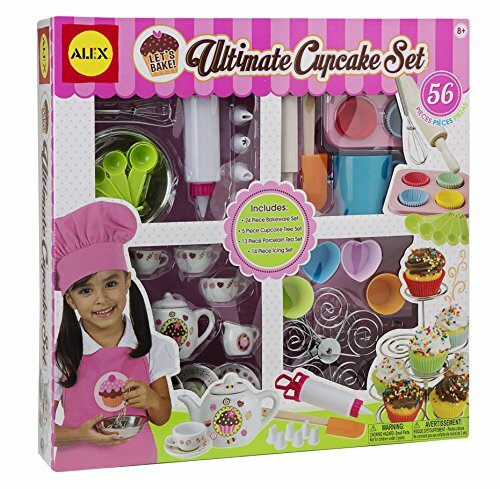 The set is ideal for any kids who love tea parties, baking or even pretending to own a cupcake shop! This giant set comes with; 24 piece bake ware set: rolling pin, measuring cup, spatula, pink enamel cupcake pan and 20 paper baking cups. 5 piece cupcake tree set: a 3-tiered cupcake holder with 2 heart shaped baking cups and 2 round baking cups; 13 piece porcelain tea set: 4 teacups, 4 saucers, teapot with lid, creamer and sugar bowl with lid; and 14 piece icing set: 5 measuring spoons, stainless steel mixing bowl, whisk, Icing Syringe with 6 tips. Recommended for children 8 years of age and older.